Join WKMS Wednesday for live KET coverage of Governor Matt Bevin’s State of the Commonwealth Address. Bevin addresses a joint session of the House and Senate. Join WKMS Tuesday evening for live coverage of Governor Matt Bevin's State of the Commonwealth/Budget Address. This address begins at 6 p.m. (Central Time). We thank KET for making this broadcast possible. FRANKFORT — In his final State of the Commonwealth address, Gov. Steve Beshear celebrated many of his major policy accomplishments during his tenure and called on lawmakers to continue moving the 2015 session toward job-creation initiatives. The over-riding theme of Wednesday evening’s address was Beshear’s advocacy for workforce development in Kentucky, and the four ways he says he’s strengthened it: early childhood development, education reform, affordable healthcare, and low taxes. Gov. 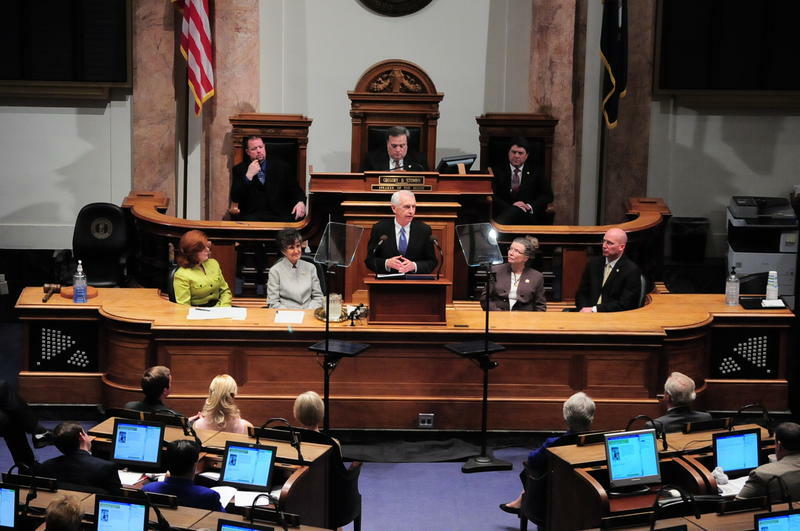 Steve Beshear's State of the Commonwealth address focused on reinvesting in education and tax reform in addition to praising Kentucky's state health exchange, kynect. Below are responses to that address from both Republican and Democratic legislators who responded to calls. Rep. Myron Dossett took issue with Beshear's praise of kynect, saying the state health exchange had added many people to Medicaid rolls that the commonwealth is already struggling to pay. He is also concerned with expanding gambling. Dossett was pleased to hear discussion about tax reform, but he wants a straight sales tax that would eliminate the state income tax.